Mollie Hemingway posted an article at The Federalist today explaining why she didn’t believe the Trump-Russia collusion story. It is a compelling analysis of how events unfolded. I strongly suggest that you follow the link above and read the entire article. In other calls with advisers and political surrogates in the days after the election, Hillary declined to take responsibility for her own loss. ‘She’s not being particularly self-reflective,’ said one longtime ally who was on calls with her shortly after the election. Instead, Hillary kept pointing her finger at Comey and Russia. ‘She wants to make sure all these narratives get spun the right way,’ this person said. In Brooklyn, her team coalesced around the idea that Russian hacking was the major unreported story of the campaign, overshadowed by the contents of stolen e-mails and Hillary’s own private-server imbroglio. It seems as if the Russia conspiracy theory was the result of refusing to accept responsibility for losing an election and simply became the basis of an attempt to unseat an elected President. Also, I believed intelligence agencies when they claimed they would selectively leak against Trump as retaliation for his criticism of them, and knew to be skeptical of anonymous leaks. It helped that someone inadvertently revealed some information to me about the source of the information CNN had been given. It wasn’t just about not falling for the fake conspiracy theory. If Trump was not what all the media outlets long suggested he was — a traitor who was conspiring with Russia — that meant that he was the victim of an information operation that was being funneled through the highest powers of the federal government. The lady has amazing insight. Today The American Greatness website posted an article by Victor Davis Hanson about the Mueller investigation. The article is a refreshing bit of common sense in a world of spin. Special counsel Robert Mueller’s investigation was star-crossed from the start. His friend and successor as FBI director, James Comey, by his own admission prompted the investigation—with the deliberate leaking of classified memos about his conversations with President Donald Trump to the press. It is likely that during the 2016 campaign, officials at the Department of Justice, FBI, CIA and National Security Agency broke laws to ensure that the outsider Trump lost to Hillary Clinton. FBI and Justice Department officials misled the Foreign Intelligence Surveillance Court in order to obtain warrants to surveil Trump associates. National security officials unmasked the names of those being monitored and likely leaked them to the press with the intent to spread unverified rumors detrimental to the Trump campaign. A spy on the federal payroll was implanted into the Trump campaign. Hillary Clinton’s campaign team paid for research done by a former British intelligence officer working with Russian sources to compile a dossier on Trump. Clinton hid her investment in Christopher Steele’s dossier by using intermediaries such as the Perkins Coie law firm and Fusion GPS to wipe away her fingerprints. As a result of wrongful conduct, more than a dozen officials at the FBI and the Justice Department have resigned or retired, or were fired or reassigned. Yet so far none of these miscreants has been indicted or has faced the same legal scrutiny that Mueller applies to Trump associates. There is no doubt that Hillary Clinton destroyed evidence when she was being investigated for her private email server, but somehow no one in the Justice Department seems concerned about that. Can you imagine what would happen if you or I destroyed subpoenaed evidence? The only way to clear up this messy saga is for Trump to immediately declassify all documents—without redactions—relating to the Mueller investigation, the FISA court warrants, the Clinton email investigation, and CIA and FBI involvement with the dossier, and the use of informants. Second, there needs to be another special counsel to investigate wrongdoing on the part of senior officials in these now nearly discredited agencies. The mandate should be to discover whether there was serial conflict of interest, chronic lying to federal officials, obstruction of justice, improper unmasking and leaking, misleading of federal courts, and violation of campaign finance laws. It is past time to stop the stonewalling, the redacting, the suppression, the leaking to the press and the media hysteria. The government must turn over all relevant documents to two special counsels and free each to discover who did what in 2016. Americans need the whole truth to ensure equality under the law and to thereby set us free from this nearly two-year nightmare. Let the truth come out. There is an old joke about a man who was walking around under a street light and another man asked what he was doing. He explained that he was looking for his car keys which he had dropped across the street next to his car. The other man then asked why he wasn’t looking for the keys where he had dropped them. The first man then answered, “Because the light is better here.” That pretty much describes the Mueller investigation into Russian interference in the 2016 election. There is a lot of low-hanging fruit for investigators on one side that the investigation chooses to ignore. There is no evidence on the other side, so the investigators are chasing rabbit trails. Yesterday Kimberley Strassel posted an article at The Wall Street Journal about the Mueller investigation. And they are now witnessing unequal treatment in special counsel Robert Mueller’s probe. Yes, the former FBI director deserves credit for smoking out the Russian trolls who interfered in 2016. And one can argue he is obliged to pursue any evidence of criminal acts, even those unrelated to Russia. But what cannot be justified is the one-sided nature of his probe. If there is only “one set of rules,” where is Mr. Mueller’s referral of a case against Hillary for America? Federal law requires campaigns to disclose the recipient and purpose of any payments. The Clinton campaign paid Fusion GPS to compile a dossier against Mr. Trump, a document that became the basis of the Russia narrative Mr. Mueller now investigates. But the campaign funneled the money to law firm Perkins Coie, which in turn paid Fusion. The campaign falsely described the money as payment for “legal services.” The Democratic National Committee did the same. A Perkins Coie spokesperson has claimed that neither the Clinton campaign nor the DNC was aware that Fusion GPS had been hired to conduct the research, and maybe so. But a lot of lawyers here seemed to have been ignoring a clear statute, presumably with the intent of influencing an election. Of the seven U.S. citizens Mr. Mueller has charged, five have been accused of (among other things) making false statements to federal officials. 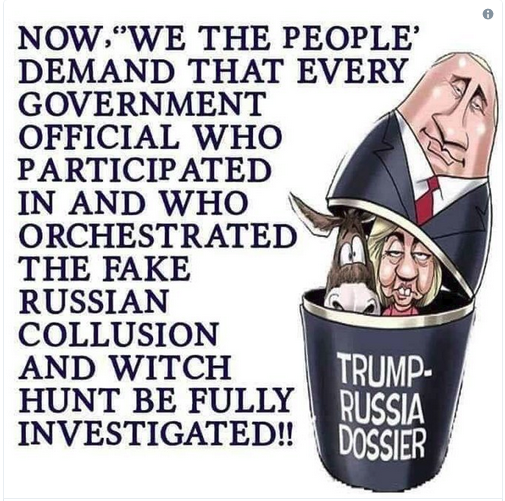 But there have been no charges against the partisans who made repeated abjectly false claims to the FBI and Justice Department about actions of their political opponents. There have been no charges against those who leaked classified information, including the unprecedented release of an unmasked conversation between former national security adviser Mike Flynn and a Russian ambassador. Nothing. Some of these charges might not stand up in court, but that’s beside the point. Plenty of lawyers would poke holes in the campaign-finance charges against Cohen, or the “lying” charges against Mr. Flynn. Special counsels wield immense power; the mere threat of a charge provokes plea deals. It’s the focus that matters. Prosecutors can claim all they want that they are applying the law equally, but if they only apply it to half the suspects, justice is not served. Mr. Mueller seems blind to the national need for—the basic expectation of—a thorough look into all parties. That omission is fundamentally undermining any legitimacy in his findings. Lady Justice does not wear a blindfold over only one eye. I guess it’s okay for the FBI to lie to the FISA Court but not okay for regular people to lie to the FBI. Seems like a double standard to me. The let’s-trap-Trump major media is getting old. The memes on Facebook are having a ball with some of the reporting. One meme stated that Trump should come out against the wall so that Democrats would support it. Things have gotten that bad. Last weekend there was a hair-on-fire story that totally illustrated how weird things have become. Byron York posted an article at The Washington Examiner on Monday about the latest effort by the mainstream media to get Trump. I don’t know how the average voter reacted to the excited reports by the mainstream media, but to an informed voter, the reports were pathetic. The reporting had to do with a Trump Tower meeting between Donald Trump, Jr., and Russian-born American lobbyist Rinat Akhmetshin; Irakly Kaveladze, a Russian associate of the businessman Aras Agalarov, who was involved in the 2013 Miss Universe pageant with the Trumps; British music promoter Rob Goldstone; Russian-born American translator Anatoli Samochornov; and Russian lawyer Natalia Veselnitskaya (who gave written answers). …the Senate Judiciary Committee… also interviewed Fusion GPS’s Glenn Simpson, who did not attend the meeting but who met with Veselnitskaya both before and after the meeting and who prepared some of the material that Veselnitskaya presented. Are you getting the feeling that this was a set up? Donald Trump, Jr., was lured to the meeting on the premise that Veselnitskaya had incriminating information on Hillary Clinton. When he got there, the meeting was about Russian adoptions. But when the meeting took place, the “information that would incriminate Hillary” was nowhere to be found. Veselnitskaya, who was connected to the Kremlin and at the same time working with Fusion GPS, spoke briefly and vaguely about some sort of distantly-Clinton-related tax matters in Russia — none of the Americans had any idea what she meant — and then quickly moved to the issue of adoption. When Russians like Veselnitskaya talk about adoption, they’re not really talking about adoption. They’re talking about the Magnitsky Act, the U.S. law placing sanctions on Russia. In retaliation for the Act, Russian President Vladimir Putin cut off American adoptions of Russian children. So from a Russian standpoint, the adoption battle is really about the Magnitsky Act, and the Magnitsky Act is about U.S. sanctions on Russia. Several participants told the Senate Judiciary Committee that much of the meeting was about adoption. Start off with Akhmetshin. Classic bait and switch. But I have one question. Why is the media so upset about Donald Trump, Jr.’s meeting but not upset about the collusion with the Russians by the Clinton campaign involving the Russian dossier? Also, does anyone else think it odd that Glenn Simpson met with Russian lawyer Natalia Veselnitskaya both before and after the meeting. Remember the connection between Fusion GPS and Bruce Ohr. Seems like a bit of a double standard. As the saying goes–“When you are up to your neck in alligators, it is hard to remember that your objective was to drain the swamp.” As we watch the deep state react to being backed into a corner, it is good to remember that expression. Let’s try to put the ‘hair-on-fire’ reporting of the President’s statements at his press conference with Putin in perspective. First of all, we have seen in the short time that Donald Trump has been President that he tends to be polite in press conferences. We also have learned that he tends to be tough in private talks. One of the hair-on-fire media statements is that Putin must have something on President Trump. He may, but I can guarantee he has a whole lot more on Hillary Clinton. Last week we learned that a “foreign entity” may have been secretly receiving Hillary Clinton’s emails while she was Secretary of State, including many that contained classified information. And that the FBI apparently ignored this information during its “investigation.” The reaction by the press to this bombshell? Crickets. At one point during Peter Strzok’s congressional testimony last week, Rep. Louie Gohmert made a stunning claim: FBI investigators were told that Clinton’s emails had been surreptitiously forwarded to a “foreign entity.” And the FBI investigators who were allegedly conducting a thorough, unbiased, professional probe into Clinton’s mishandling of classified materials ignored it. Trump did business with Russia for years. It is quite possible some corners were cut. 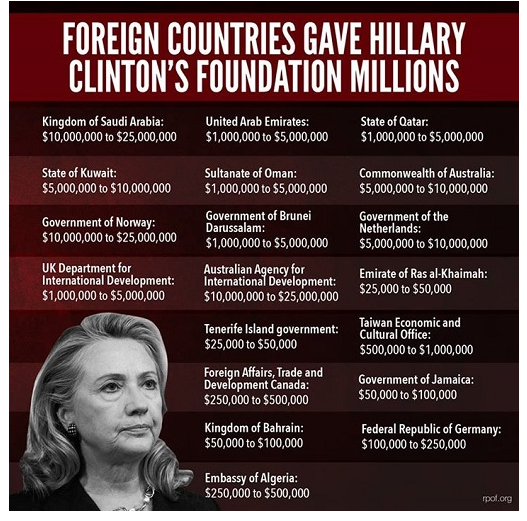 How does that stack up to information that could have been obtained from Hillary Clinton’s server–Clinton Foundation activities illegally related to State Department access, misuse of funds going into the Clinton Foundation, pay-for-play schemes, Uranium One information, etc. It seems to me that anything Putin may or may not have on President Trump pales in comparison to what Putin has on Hillary Clinton. It was obvious she was hiding something. And think about it, she set it up in 2009, before becoming Secretary of State. So, she anticipated having exchanges that she would not want anyone to see. So, we’ve been asking ourselves on this set for a year almost, what exactly didn’t she want people to see? And as we speculated, the most plausible explanation was the rank corruption of the Clinton Foundation, and its corrupt — I don’t know if it’s illegal, but corrupt relationship with the State Department. And her only defense as we saw earlier– the Democrats are saying, well, there was nothing she did… that was corrupted by donations. You can believe that if you want, but there’s a reason that people give donations in large amounts, and that’s to influence the outcome of decisions. So, this — we are getting unfolding to us, exactly what she anticipated having to hide, and it is really dirty business. The above quote is from October 2016. As usual, the late Charles Krauthammer was right on target. Browder made billions in Russia during the 90’s. In December, a Moscow court sentenced Browder in absentia to nine years in prison for tax fraud, while he was also found guilty of tax evasion in a separate 2013 case. Putin accused Browder’s associates of illegally earning over than $1.5 billion without paying Russian taxes, before sending $400 million to Clinton. Is it possible that the hair-on-fire reporting on President Trump’s statement is simply to distract us from the questions about the $400 million donation to the Clinton campaign? The Daily Caller is reporting that Demand Justice (DJ), a group organized and financed by a 501(c)(4) called the Sixteen Thirty Fund, which collected some $2.2 million in contributions from the Open Society Policy Center (OSPC), one of George Soros’ primary donation vehicles, between 2012 and 2016, has pledged to put $5 million behind an effort to stop Judge Brett Kavanaugh’s confirmation to the U.S. Supreme Court . If George Soros opposes Judge Kavanaugh, then I have one more reason to support the Judge. …Demand Justice was formed in the spring of 2018 as the progressive counterpart to a constellation of conservative advocacy groups which advertise and organize around judicial confirmations. Republicans have significantly outpaced Democrats in this space in recent years, given conservative voters’ sustained interest in the federal courts. Still, the spending patterns offer some insight into the strategies pursued by the two rivals. As of Oct. 19, Clinton had raised some $513 million and spent $450 million on itemized expenses. The Trump campaign had raised $255 million and spent $239 million. I hope the Soros-funded group is as successful in blocking Judge Kavanaugh as Hillary Clinton was in winning the presidency. Thanks to the Washington Post’s unnamed law-enforcement leakers, we know Mr. Nunes’s request deals with a “top secret intelligence source” of the FBI and CIA, who is a U.S. citizen and who was involved in the Russia collusion probe. When government agencies refer to sources, they mean people who appear to be average citizens but use their profession or contacts to spy for the agency. Ergo, we might take this to mean that the FBI secretly had a person on the payroll who used his or her non-FBI credentials to interact in some capacity with the Trump campaign. We now know the identity of this person, and it has been confirmed that he was in the Trump campaign working for the FBI. So how does the media spin this? …But Trump and his backers are wrong about what it means that the FBI reportedly was using a confidential source to gather information early in its investigation of possible campaign ties to Russia. The investigation started out as a counterintelligence probe, not a criminal one. And relying on a covert source rather than a more intrusive method of gathering information suggests that the FBI may have been acting cautiously — perhaps too cautiously — to protect the campaign, not undermine it. Was there an FBI spy in the Hillary Clinton campaign to make sure the Russians did not influence the campaign? If American voters fall for this spin, we probably do deserve to lose our republic. Do You Still Trust The Mainstream Media? Yesterday The Daily Caller posted an article which sums up how the mainstream media works. The Daily Caller co-founder then played a clip of CNN hosts trying to make Brazile look bad over her sharing a primary debate question with Clinton’s campaign, which he compared to political talking points. The mainstream media has a stake in this fight. They supported Hillary Clinton for President and pretty much ignored any unfavorable stories about her. I think the most damaging thing in Donna Brazile‘s book is her comment about Seth Rich. Seth Rich was killed in Washington, D.C., in what was described as a foiled robbery–nothing was taken from him. There are people who believe that Seth Rich was the person leaking information to Wikileaks. Julian Assange has stated numerous times that the leaked emails he received were not from Russia–they were from inside the campaign. Considering the number of Clinton associates or people who have told the truth about the Clintons who have died suddenly in mysterious circumstances, I can understand why Donna Brazile feared for her safety. The former DNC interim chair revealed in Politico last week that the Clinton campaign had a fundraising agreement with the DNC long before it was clear she would be the nominee, a move that many saw as tipping the scales against Sen. Bernie Sanders. The federal government pretty much allows parties to run their campaigns with minimum federal intervention, but this may cross a line. I do know that the funneling of money through various entities to the Clinton campaign probably violated campaign finance laws. We will have to see how much of what was done was illegal and if charges will be brought. This article is based on an article posted in the Malaysia Chronicle on Tuesday. The article deals with the 1MDB Scandal. Donation is the buzzword for this year, both in the United States as well as Malaysia, but serving different purpose. In US, as temperature rises in the wake of Clinton-vs-Trump for the presidential general election this coming November, hundreds of millions of dollars are being pumped into campaigns to influence American voters. In the case of Malaysia, Saudi Arabia’s claim that it had donated US$681 million to Malaysian Prime Minister Najib Razak, is now busted. The press conference held by the U.S. Attorney General Loretta Lynch and US Department of Justice last week has not only exposed that money was stolen from 1MDB, but also proved that the Saudi had lied about its donation. The article speculates that the money will be given to the Clinton Foundation or the Clinton Campaign so that when the Department of Justice investigates, Razak will get a favorable result. Whether or not that happens, the chart below tells us a lot about the money flowing into the Clinton campaign and the Clinton Foundation. These numbers are somewhat alarming when you consider that only 9 or 10 percent of the money donated to the Clinton Foundation actually goes to help those the foundation is claiming to help. Charity Navigator placed the Clinton Foundation on a watch list. There are a whole lot of things going on with the Clinton Foundation and the Clinton campaign that are downright scary.